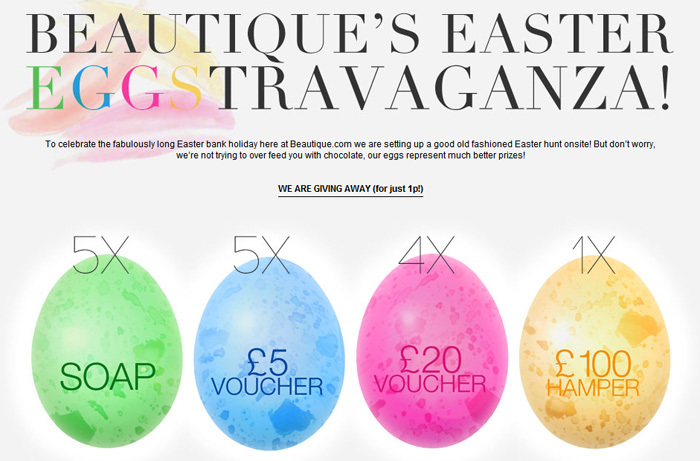 Beautique are giving away 15 prizes for the princely sum of 1p each! Get your sleuthing skills sharpened pronto because the hunt begins this morning at 11am! Scour the site for the hidden eggs and checkout your loot first to claim the goodies for a single penny. To read the rules and learn how to take part in the Egg-stravaganza, head over to the competition landing page to check out the finer details. They’ll also be live updating the competition status on their Twitter and Facebook pages. Yay I got a £5 one!! 😀 Saw the £100 hamper but as soon as I clicked it it was out of stock! I just got £20 as well! Thanks for this, I got £5!